Build a SHIP must be 100 studs or longer between September 1st and October 1st. That's it! What do I do? Simple! Start building your SHIP starting on Sept 1st, and start posting WIP shots as you go so everyone can all praise your guts for building a SHIP in a month! 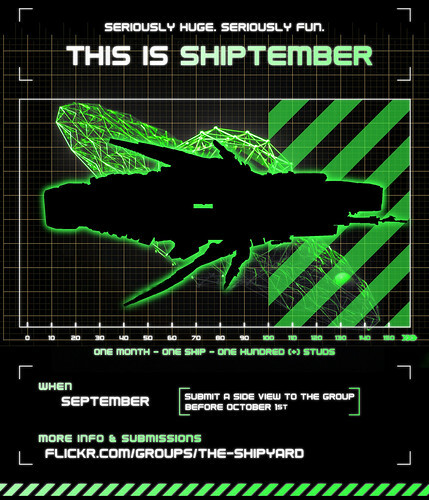 Pre-SHIPtember Rule! - Start whenever! Since a good portion of people are going off to school in September or otherwise disposed, you can start now as long as you start posting in the WIP thread - you have one month to finish. What scale should the SHIP be? Whatever floats your SHIP.